Located in Loh Pared Beach, this beautiful property is 50 minutes from Phuket International Airport by car and speed boat. It takes 30 minutes from the airport to Ao Po Grand Marina Pier and 20-minute boat ride from Ao Po Grand Marina Pier to the establishment. Guests will find cosy accommodation, equipped with a fridge and a balcony at this hotel. Travellers can relax at the spa or enjoy massage treatments offered at the residence. For their convenience, there is a 24-hour front desk service and a tour desk to help guests with sightseeing tours. 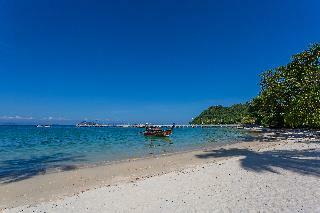 A selection of both Thai and international cuisines are offered at the on-site restaurant, By The Sea & Bar Restaurant. 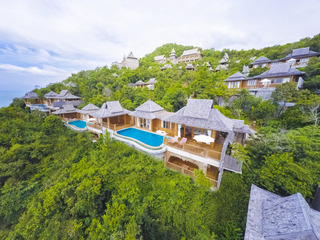 "Located on the remote northern tip of Koh Yao Noi, TreeHouse Villas is an adults-only luxury resort offering spacious airconditioned villas dotting the border of lush tropical forest, towering limestone cliffs, and 400 meters of private beach. Enter each of the signature TreeHouse Villa over a suspension bridge. Where downstairs guests will find the spacious outdoor deck-area with a private plunge pool, dining area, sun beds and stand-up bar with a mini-fridge and mini wine-cooler. Upstairs is the luxurious airconditioned bedroom with a grand king-sized bed, flat-screen TV, balcony with views of Phang Nga Bay, and spacious bathroom with the unique hammock shaped bath. Guests can make custom requests for in-villa dining, spa, yoga, or book excursions through the e-butler tablet system.The island of Koh Yao Noi is only accessible by boat. 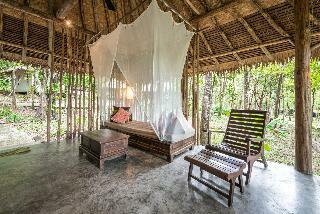 This resort is located in the heart of Phang-Nga Bay on the Andaman Sea. It is surrounded by 42 beautiful islands and is easy to reach via a 40-minute crossing by speed boat from Phuket or Krabi. 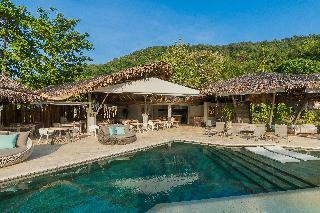 Built in 2009, this property is a boutique hideaway, featuring the exclusive total of only 40 rooms. Each of the private bungalows is individually styled in soft furnishings and decorated with Thai folk art featuring handcrafted woodcarvings. The rooms come with a large private outdoor bathroom with a rain shower and a hairdryer. Internet access and a host of modern amenities are provided in each unit. Guests will appreciate the outdoor infinity pool and poolside snack bar overlooking the sandy beach and the islands beyond. An activity centre, which offers sightseeing tours, bicycle tours, fishing, batik painting and local handicrafts, will help guests find their preferred pastime. Located within a scenic speed-boat ride from Phuket, through the spectacular, world famous Phang Nga bay, this establishment is situated in a remote corner of the idyllic island of Ko Yao Noi. Nestled within a national reserve and tropical rain-forest on its own private bay and surrounded by towering limestone cliffs, this property is a great option both for business and leisure travellers alike. This resort offers a true escape for those seeking privacy and seclusion, without compromising comfort and convenience. It offers exclusive and superior guest rooms, suites and villas for a memorable and luxurious accommodation experience. At the on-site restaurants, visitors will be tempted to try delicious seafood and BBQ specialities. KA heaven for nature lovers & for those who need to escape from the hustle and bustle come across from Phuket on the untouched virgin Island at the South of Kao Yao Yai and heat in the Nature at Kohyao Heaven Resort. Whilst the resort is truly unique situated on a wide sand beach and natural of Vegetable organic plantation, perfect location and next to Prunai Pier easy to accesses to other islands and PP island Krabi Just 30 minutes from Phuket you will reach the heaven of Koh Yao Yai where is not just your private getaway destination. It's the place you can combination your holiday trip with a cultural attraction and culture experiences.oh Yao Heaven Resort;Private, Comfortable and Total relaxing. Koh Yao Heaven Resort designed a contemporary Tropical Thai concept feature air conditioning, all room with personally balcony and sea views from almost every room.